Moscow court declines to hear Oleg Navalny's motion for release | Russian Legal Information Agency (RAPSI). 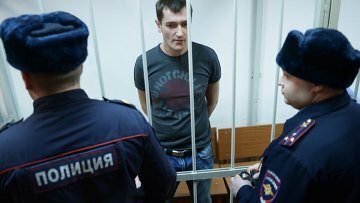 MOSCOW, January 14 (RAPSI) – Moscow's Tverskoy District Court declined on Wednesday to hear a motion for release from pretrial detention center filed by Oleg Navalny, the younger brother of anti-corruption campaigner Alexei Navalny, RAPSI learned in the court on Wednesday. Oleg Navalny requested that he be released from detention as the ruling was not final. He filed a similair motion with Moscow's Zamoskvoretsky District Court. The brothers have appealed the sentence on Monday. In the meantime, the Federal Penal Service has complained that Alexei Navalny violated the terms of his house arrest. 11:32 14/01/2015 Moscow's Tverskoy District Court declined on Wednesday to hear a motion for release from pretrial detention center filed by Oleg Navalny, the younger brother of anti-corruption campaigner Alexei Navalny.